The amazing LG BD590 Blu-ray Disc™ player is the latest in innovative technology of Blu-ray and instant streaming technologies. That is getting the best way to enjoy Full HD 1080p with Blu-ray or the unparalleled entertainment options of being hooked up to NetCast™ Entertainment Access. Enjoy the 250GB Media Library that lets you store your music, photos and HD movies you purchase from Vudu. This is something better than Blu-ray and beyond. The Media Library integrated hard drive allows for easy storage and instant playback of music, photos, personal videos and VOD content available through the Vudu movie service. The end of “there’s nothing on.” NetCast™ Entertainment Access brings the best Internet services direct to your TV—no computer required. Instantly access movies and TV shows, news and weather and the world’s largest library of HD movies in 1080p. Make the most of your HDTV. 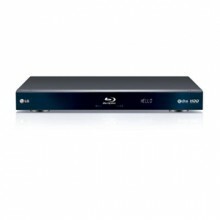 Blu-ray disc playback delivers exceptional Full HD 1080p video performance. A quick-opening tray - ready to play before you hit the couch. Hard Disk Capacity 250 GB, HD Video Up to 35 Movies, SD Video Up to 160 Movies, MP3 Up to 88,000 Songs. Click the button below to add the LG BD590 Blu-ray Disc Player to your wish list.